Stop simple sabotage in your workplace today! 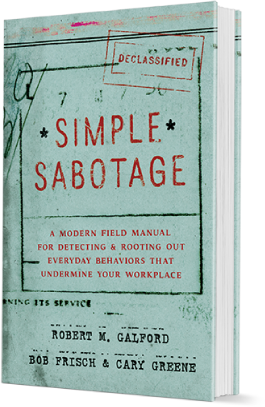 Workplace inefficiency can be traced back to 1944, when the Office of Strategic Services (the predecessor to today’s CIA) issued a document called the Simple Sabotage Field Manual, containing techniques designed to demoralize the enemy. Among its pages were techniques for organizational sabotage. Going unnoticed, these techniques still lurk in our midst today. Luckily there is now a book to expose and inoculate your organization against them. Are these familiar in your office? 01INSIST ON DOING EVERYTHING THROUGH CHANNELS. 02Make speeches. Talk as frequently as possible and at great length. 03Refer all matters to committees. 04Haggle over precise wordings of communications. 05Bring up irrelevant issues as frequently as possible. 06Refer back to matters already decided upon and attempt to question the advisability of that decision. 07Advocate caution and urge fellow-conferees to avoid haste that might result in embarrassments or difficulties later on. 08Be worried about the propriety of any decision.